Air source heat pumps, also known as air to water heat pumps, work in a similar way to ground source heat pumps except that they extract heat out of the surrounding air instead of the ground. If you do not have suitable land area for a ground source system, or have a very highly insulated new build property, or if you want heating for an outdoor pool, then an air source heat pump may well be an ideal solution. Air source heat pumps tend to require less work to install than ground source heat pumps and therefore have a lower installation cost. All air source heat pump systems we install are designed with an advanced controller that distributes heating and/or hot water to the property and compensates for the weather throughout the year by sensing the outside temperature and adjusting output accordingly. Air source heat pumps are compatible with both radiator based and under floor heating systems and can be used together with most electric boilers, oil-fired boilers or equivalent when docking to an existing heating/hot water system. An air source heat pump extracts energy in the form of heat from the outside air in the same way that a fridge extracts heat from its inside. This is the same gas compression refrigeration cycle as a ground source heat pump, but this time the energy source is outside air drawn across the evaporator heat exchanger by a fan. This might sound impossible during the winter months, but given that the refrigerant in a heat pump boils at between -15ºC and -30ºC there is always energy to be extracted from the air regardless of the weather. The key is to understand how to do this efficiently and to understand the limitations of air source heat pumps in these circumstances and to design the system to accommodate them. This is where isoenergy’s expert renewable energy design services can make all the difference between a system working efficiently or not. 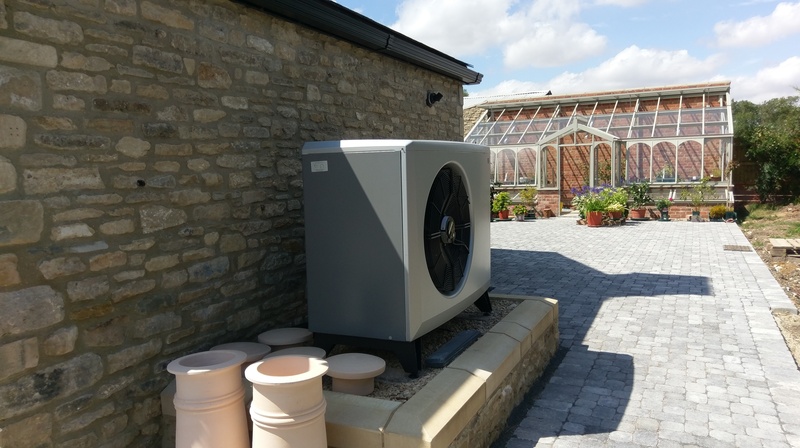 The main advantages of an air source heat pump is that you do not have the cost and disruption of laying the ground array, therefore the space needed to install one is much less than to install a ground source heat pump. It is often said that an air source heat pump is not as efficient as a ground source heat pump. 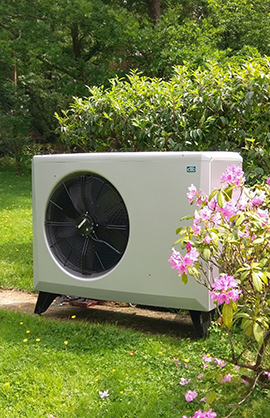 However, in the spring and autumn months when air temperatures may be higher than ground temperatures, the air source heat pump can outperform a ground source heat pump by a significant margin. That said, as air temperatures in the UK are generally between 0-5ºC during the bulk of the heating season, ground source systems are better suited to our winter climate where there are appropriate source conditions for them to be deployed. For outdoor swimming pool owners, an air source heat pump is almost always the most economical option for pool water heating as the air temperature is generally higher than the ground temperature for much of the UK outdoor swimming season. In the winter months you could expect an average CoP (the ratio of energy produced vs. the electricity required) of 3:1, and in the summer as high as 5:1. It should be stressed that not every air source heat pump is optimised for the UK climate. isoenergy recognises that some air source heat pumps are designed for much dryer winters and are therefore equipped with much smaller heat exchangers. These tend to freeze up more frequently in the UK's damp winter climate. When this happens, the air source heat pump uses electricity to defrost the evaporator heat exchanger in a process called the defrost cycle. The more time an air-source unit spends in the defrost cycle, the less efficient it is overall which results in higher running costs. isoenergy has rigorously tested all the air source heat pumps that we specify to ensure that excessive defrosting is avoided. Furthermore, isoenergy is not tethered to one manufacturer to ensure that we can continue to offer bespoke solutions rather than forcing one brand or model on our clients. isoenergy has years of experience consulting on, designing and installing bespoke air source heat pump systems and can dock to existing fossil fuel systems or combine with other renewables such as solar thermal, solar panels and ground source heat pumps. It is in the interest of the manufacturers to quote performance figures based on ideal operating temperatures rather than on how the heat pump will work in the British Isles. Isoenergy will actually test any air source system before we start installing them for our clients. This way we can measure the actual heat output, coefficient of performance and operating costs in a real-world situation. This helps us size the air source heat pump accurately. Many other installers will sell a heat pump based on its ideal performance rating leading to higher running costs and reduced efficiency. Ideally, the evaporator unit should be installed close to the plant room. The unit will require a good flow of air on both the input and exhaust sides and should not be placed underneath trees or where a risk of falling debris may damage the unit and clog the heat exchanger. Minimum clearances must be observed to avoid low air flow or the risk of recycling the cold exhaust air. There are also planning considerations to look into for larger units. Do you have single phase or three phase electricity and does this run to your proposed location for the air source heat pump? Isoenergy is able to install air source heat pumps on a single phase but are limited to around 15kW in heating load. Properties that need more heat than 15kW will need either a dedicated single-phase just for the heat pumps or a three phase supply to be installed. The air source heat pump will require a solid base with a condensate soak-away. isoenergy can provide details for this as part of the design phase of the project. Dependant on the configuration of the renewable technologies, you may need a buffer tank or higher capacity hot water storage tank. It is important to consider how large these are and whether you have enough space in your proposed plant room – again, isoenergy can advise on the appropriate plant room layout. We also offer some smaller air source heat pump systems in a split system configuration. This means the outdoor unit contains the evaporator heat exchanger and compressor and there is an indoor unit, about the same size as a fridge-freezer, that contains the condenser heat exchanger and a hot water tank. Although air source heat pumps can perform better with under-floor heating systems, they also work perfectly well with radiators, provided they are taken into consideration in the design phase. The older the radiator the better as they tend to have a larger surface area than their modern counterparts. Isoenergy can check your existing radiators are up for the job as part of the initial heat loss assessment. If you are interested in finding out if an air source heat pump is right for your property, contact us through the website or on 01293 821 345 for a free no obligation discussion and if appropriate, on-site survey.